Warning: I’ll assume before you’ve read this, that you know the basics of SEO, link building and have some experience of this. If not, please read the content on my blog to familiarize yourself, as this is pretty advanced and won’t make much sense if you don’t know the basics. So, you have a website selling a product or service. You should have an idea of the content you want to produce and the kinds of targets who would link to those said pieces. So your next concern is going to be actually acquiring links and continuing to do so. If you can master this and earn valuable white hat links in this way, I’d be surprised if anyone would stop you dominating your market. Except say… if someone has a much larger budget and are also using a white hat link building system just like you. What I describe may sound like a PBN, but this is far from a PBN and does not carry anywhere near as much risk. I would argue it will be a hell of a lot more effective and beneficial for your business in the long run as well. (I don’t run PBNs so wouldn’t know exactly what effect they do have, but I would be extremely surprised if it could outperform this method). Not to mention its a lot less of a headache to run when it is setup. So if getting long term consistent results and being able to sleep at night without worrying about Google penalties appeals to you – please read on! We’re going to utilise what we call – Micro-sites. The aim is to have 5 websites. 4 Micro-sites and one money site. The money site will act as the core website displaying our product/service which will receive links from the micro-sites. These sites will run completely stand alone and build their own audiences and communities. This means that they will build trust with the people that visit them. Say we have a business that sells Garden Furniture products. We could create 4 micro sites which are centered around audience’s who would be likely to be interested in this product. (Its important to know your target customers are for this). Micro-site 1: Gardening tips, how to guide’s. You could create content around things like treating lawns, companion planting, etc. People who take care of their garden are likely to also want garden furniture so they can enjoy it fully. Micro-site 2: Home DIY. Not directly related to gardens, but an audience who have an interest in maintaining their home, may also be interested in tidying up their garden and maintaining it- but probably not so advanced that they can construct their own furniture. Micro-site 4: Family lifestyle. Centred around family activities, days out, keeping kids occupied on holidays, etc. Family conscious audience, want to get the kids out of the house, and may spend a lot of time in the garden – hence, they may update their garden and the furniture from time to time. (1) Content creation– you’ll need a budget for this. But to save some time/effort, you could just hire someone to be in charge of content for each microsite And for instance, if you buy someone’s blog, you could just pay them a small salary to continue creating content like they did before. (2) Timelines – I’d recommend posting 1 article per site, per week. And every week, have one site post an extra piece – rotate the site posting the extra one. So essentially, you’re posting 5 pieces per week across all the microsites. (3) Links – this an important point. You will want to link from the microsites to your money sites – but don’t try to link out from every single post! Where a link to the money site would be contextually relevant and it’s a relevant article, link from there. Don’t force a link! (4) More links for support- you also want to continue building your own links, on top of these one’s you create yourself. 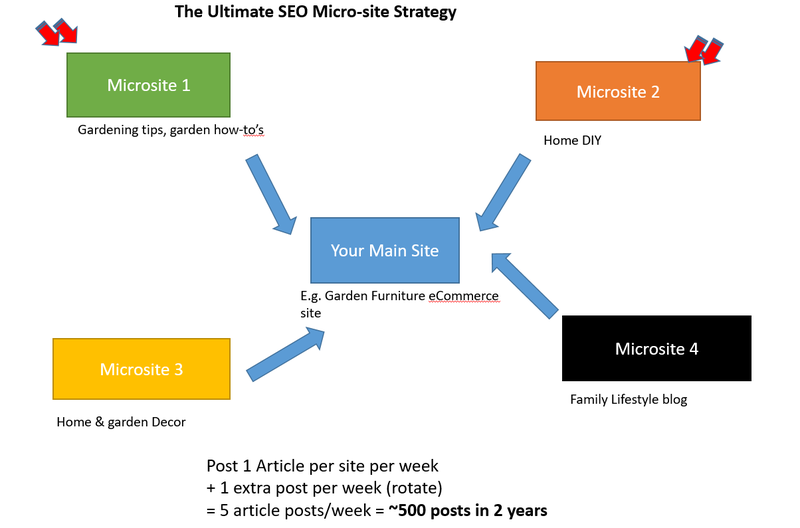 And it should be a mixture of both building links to the microsites and directly to the content on the money site. (5) Budget – 5 posts per week, means you’re going to be producing around 500 good content pieces, over the space of 2 years just for the microsites. However, once you get to that stage, the results will have compounded so much, that it will pay off so many times over for your money site. Obviously, these sites will generate their own search traffic, mainly from longtail, low competition search phrases and various social shares etc. However, if you ensure the content on it is top notch, you can drive some additional links to them so that they can rank and bring in more traffic themselves. To conclude… This strategy isn’t for everyone. And to execute this properly, you will have to spend a six figure sum over the space of 2 years. But… if you have the cashflow, and dominating your market means solidifying a seven figure or eight figure annually recurring business – then it really is a no-brainer! If all this sounds good and wonderful – but you’d rather hire a freelance seo expert to do this for you – here’s how much it’ll cost me to execute the whole process for you.